Mount Gilead is a small town in Ohio, but judging from the recent turn of events, you'd almost expect it to be located in Scranton, Pennsylvania, wishing for a golden ticket from Dunder Mifflin, a paper and office supply company. You see, the local court has run out of paper. Yes, paper. And it won't be taking any new cases until it can secure more. Which, since the court also has no remaining money and has switched to a 4 day workweek, could be a while. While the court has enough paper to finish up the current cases, it is refusing to proceed with any further legal filings unless the involved parties bring their own paper, something several agencies have already offered to do. 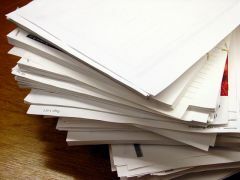 Upon hearing about the paper shortage in a memo, hopefully delivered electronically, local law enforcement officials were baffled by the decision to refuse the legal charges. State Highway Patrol Lt. Chad McGinty expressed his concern regarding trooper's ability to change driver behavior in a recent interview with the Columbus Dispatch; a question I am sure many other men and women in blue are asking themselves right now. Without fines or jail time officers lose their most powerful deterrents to crime. The absurdity of the whole scenario is sure to be seen by anyone who has had the displeasure to step foot in the courtroom as a defendant, where even a minor traffic violation carries an additional burden of "court costs" which, from experience, can almost double the cost of breaking the law. I fail to see how the court cannot simply lobby a paper surcharge on new filings; much the way companies tacked on fuel surcharges last summer. If you get caught breaking the law in Morrow County, Ohio in the near future, don't be surprised if the officer takes you to Staples before tossing you in the clink.